In an editorial titled “Narendra Modi’s Rise in India”, the New York Times (October 26, 2013), which may create major ripples around Modi’s supporters, has said that the Gujarat CM and India’s Prime Ministerial aspirant cannot hope to lead a country effectively which has multiple religions, more than a dozen major languages and numerous ethnic groups and tribes. The editorial apprehends, Modi “inspires fear and antipathy among many of its people.” The editorial has been published in the US edition of the NYT's Saturday Review. “In 2002, rioters in the western Indian state of Gujarat savagely killed nearly 1,000 people, most of whom were part of the Muslim minority. Now, barely a decade later, Narendra Modi, who was the chief minister of Gujarat at the time and still holds the office, is a leading candidate to become prime minister of India”, the editorial, written by the daily’s powerful editorial board, says. 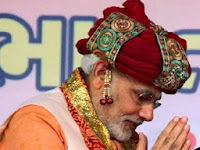 “Modi, a star of India’s main opposition party, the Bharatiya Janata Party, would become prime minister if the party won enough seats in parliamentary elections next summer with support from its political allies. His rise to power is deeply troubling to many Indians, especially the country’s 138 million Muslims and its many other minorities. They worry he would exacerbate sectarian tensions that have subsided somewhat in the last decade”, it points out. “India is a country with multiple religions, more than a dozen major languages and numerous ethnic groups and tribes. Modi cannot hope to lead it effectively if he inspires fear and antipathy among many of its people”, it concludes.